Nashville brides, have you registered for the upcoming Enchanted Brides Bridal Show? We are thrilled for you to join us on Sunday, January 28, 2018 at The Hermitage Hotel for our elegant, relaxing bridal show. The Enchanted Brides Bridal Show will be a delightful, inspiring experience full of elegant wedding planning. Enjoy a beautiful afternoon as we help you bring your wedding dreams to reality by connecting you with fabulous, talented wedding professionals. These incredible professionals would love to make your wedding dreams come true by helping you plan each and every detail, capture unforgettable moments, serve amazing foods, design your dream wedding gown, and so much more. Also, we are so excited to show you the latest trends in bridal fashion during our fashion show featuring breathtaking designs. 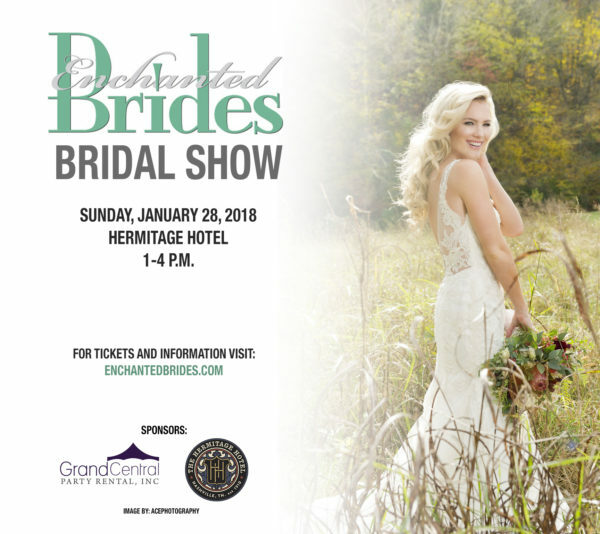 Nashville brides, you will not want to miss the Enchanted Brides Bridal Show on Sunday, January 28, 2018 from 1:00-4:00 p.m. at the historic Hermitage Hotel. Bring your maid of honor, bridesmaids, sister, and mom as you plan your dream wedding day with Nashville’s elite wedding professionals. Make sure to click here to register for the Enchanted Brides Bridal Show. We can’t wait to meet you beautiful brides-to-be! The Enchanted Brides Bridal Show is sponsored by Grand Central Party Rental and The Hermitage Hotel.